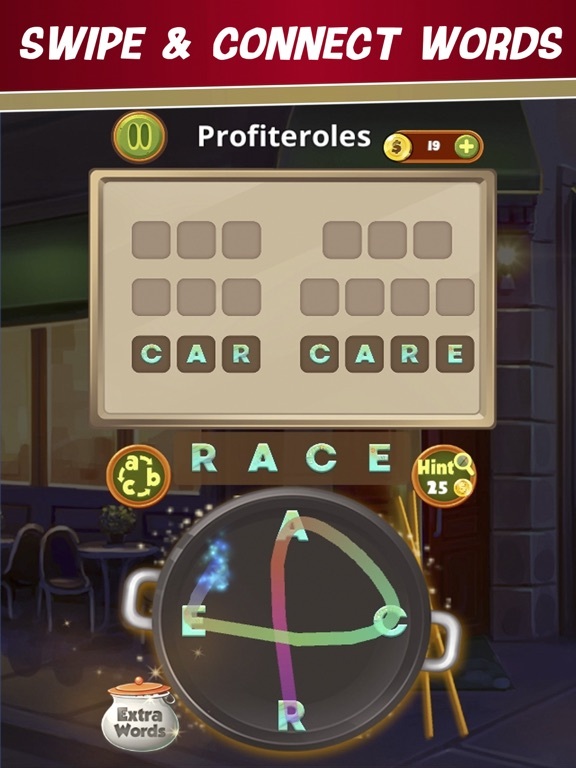 Ready for the ultimate word-making challenge with this free brain training game for kids and adults? Search for words and put together as many words as you can! Pass levels, collect coins and unlock new addictive levels in "Word Chef Mania: Puzzle Search"! Download our new brain teaser and let the fun begin! Ever wondered “how many words can you make out of one word”? 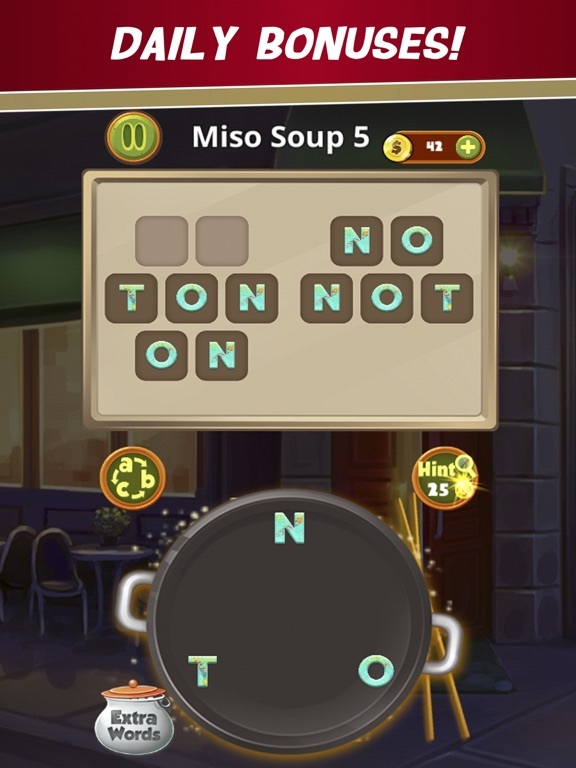 Well, test your word making abilities and combine letters in many different ways to find as many words as you can! Play word search with friends or alone – all generations of players will have fun searching for words and discovering food recipes from around the world! 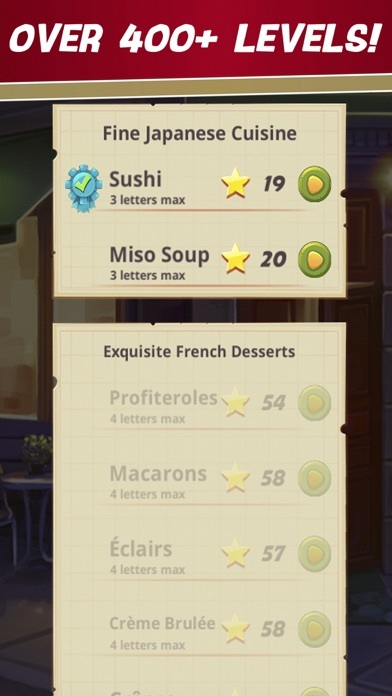 ** Delicious cooking theme! 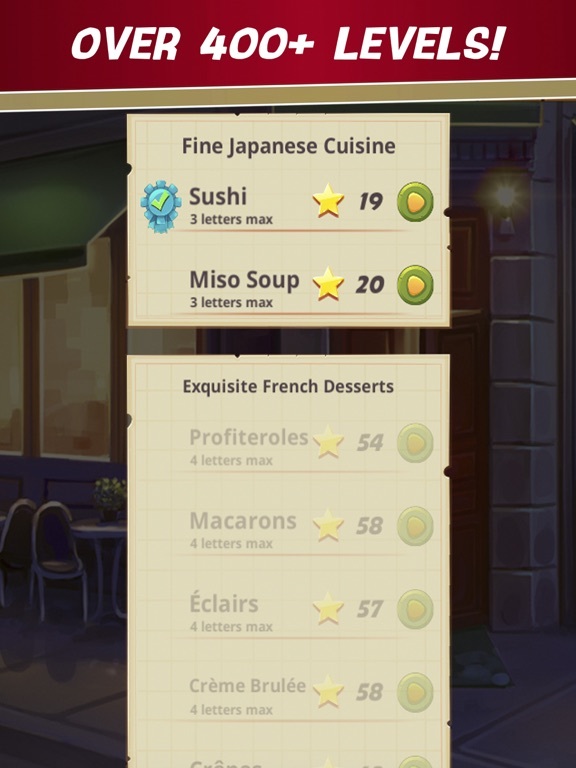 Discover various world cuisines and their top dishes! Mexican, French, Thai and more! 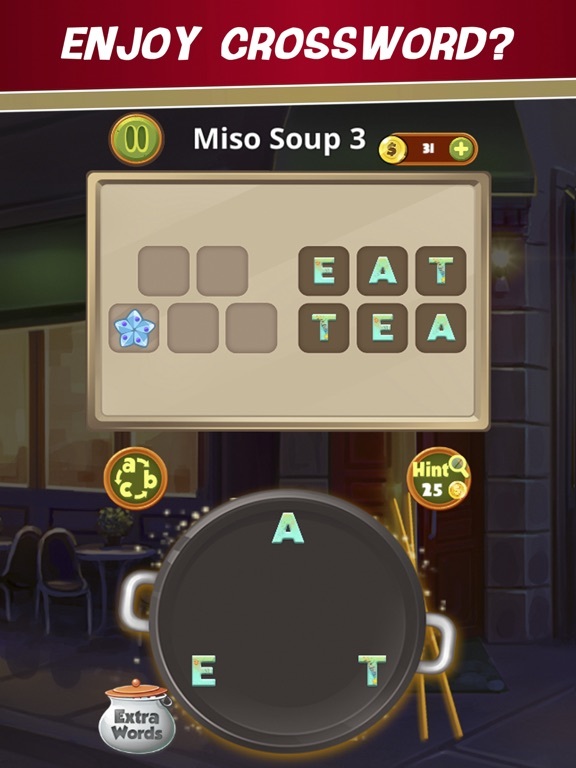 ** Different difficulty levels – make words out of 3 letters first, and progress all the way to 7 letter-levels! ** Special bonus levels for extra coins and even more fun! ** Word search puzzle with levels that will give you word hunt fever! 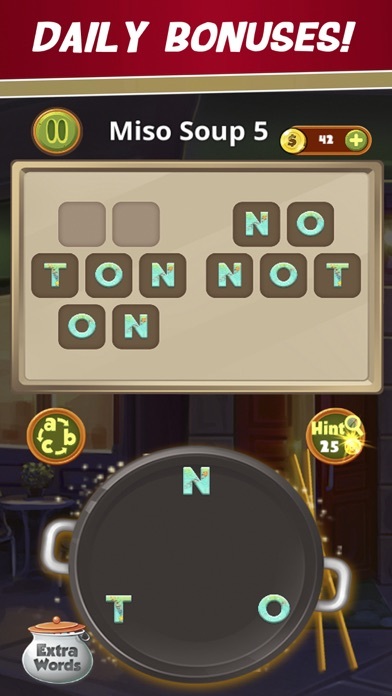 ** If you get stuck, use the Hint button and get the first letter of the word! ** The word search adventure is contagious! You won't be able to stop finding the words once you start! ** Simple, but challenging! Embark on a word finding adventure, test your vocabulary, thinking and puzzle solving skills! 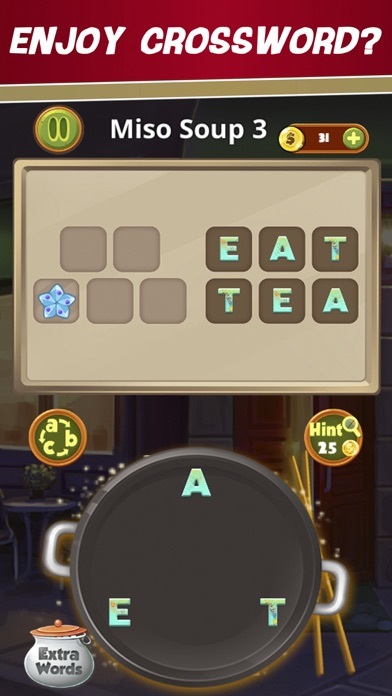 ** If you manage to pass all the levels in this word quest, you can proudly call yourself a word whizz! 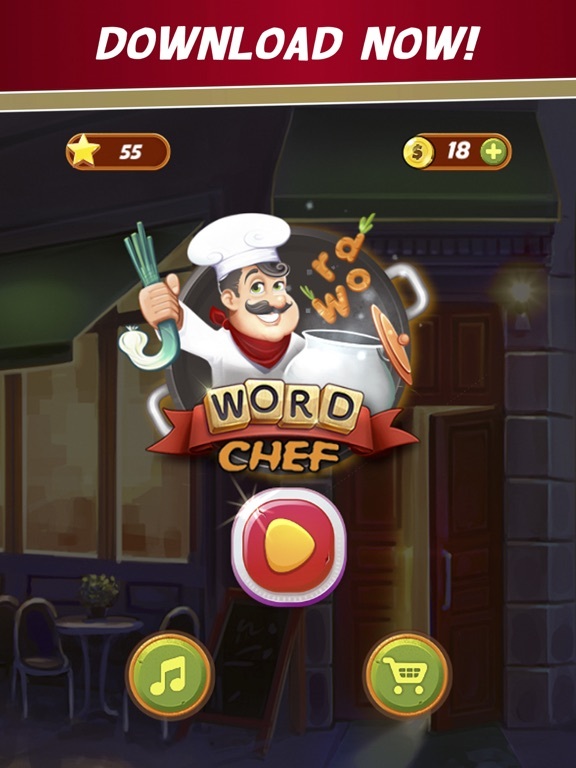 ** Download "Word Chef Mania: Puzzle Search" FREE! Stunning visuals and interesting gameplay will make word hunting unforgettable! If you love anagrams and other word games for adults, you'll enjoy our word search games with different categories and themes – it's time to become a chef of word making! Spelling bee and other spelling games, such as our word puzzle games with increasing difficulty offer a perfect start into the world of spelling and vocabulary building. "Word Chef Mania: Puzzle Search" will improve your concentration and teach you how to think fast and solve puzzles like a pro! Jumble word solver games provide spelling practice, but that is not all: word building exercises the brain, memory and fast-thinking skills! Guess all the words that are hiding in the grid and pass levels as you travel around the world and encounter delicacies of different countries in this “word search puzzle free”! Search for words and challenge your brain! 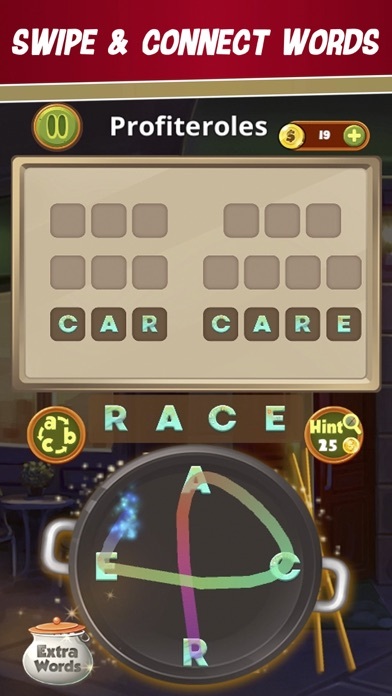 Just like with classic words crush games, your challenge is to swipe the letters and find the hidden words! Make words from given letters and progress from three letter words to up to seven letter words – the number of potential words that you can create inside this word search puzzle is head-spinning. Improve your English in an original and entertaining way – our educational mind games will become your favorite pastime activity. Play magic word search on your way to work and learn thousands of new words. Vocabulary games of English for adults and kids – see if you're an expert in English and the best anagram solver in the family. Let begin the word searching adventure! 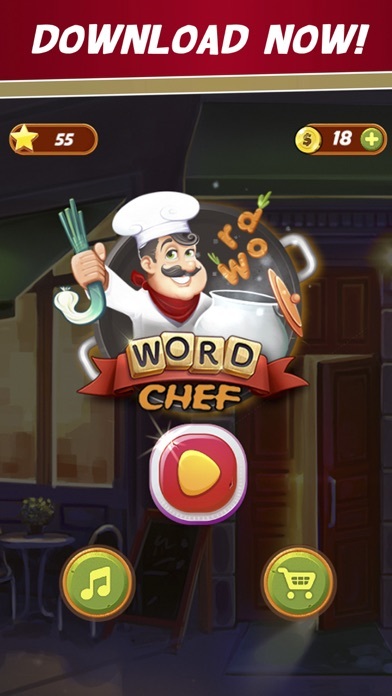 The magical and delicious culinary setting makes word making quiz even more enjoyable – download "Word Chef Mania: Puzzle Search" and start your word cooking career today!